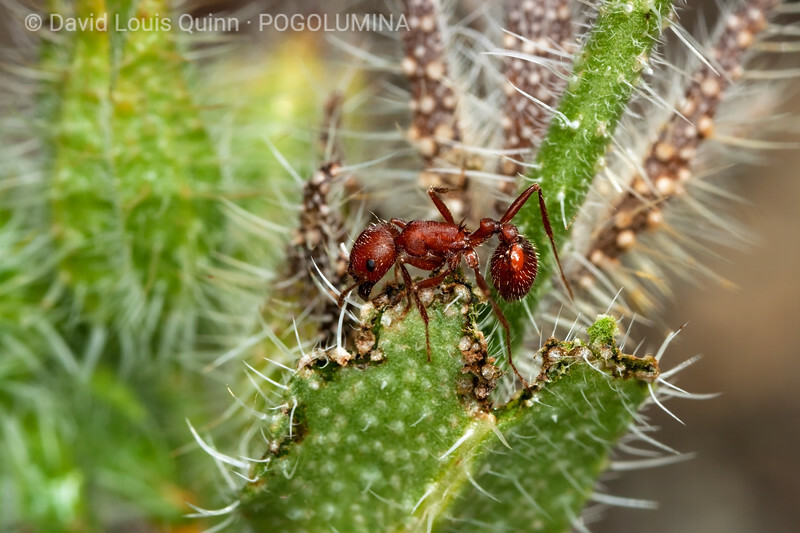 Fiddle-neck (Amsinckia sp) is a plant that we have seen Pogonomyrmex salinus interacting with at several locations. This particular plant was located approx. .6m / 2ft from a P. salinus nest entrance. As can be seen in this image, the edges of some of the leaves had been 'chewed' (it is not clear if the Pogos, or some other insect had done this). There were about a dozen P. salinus workers on the plant, and they appeared to be gathering some sort of nectar or other plant exudate. We did not see any of the workers 'chewing', or cutting into the plant. We have also observed similar behavior on fiddle-neck plants in central Oregon, where no leaves had been damaged, and the plants stood at a considerable distances from the nests.